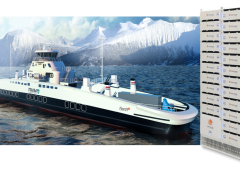 Corvus Energy will attend the 2015, 50th Anniversary Nor-Shipping Conference in Oslo Norway. Nor-Shipping is the leading maritime event week. Its top-quality exhibition, high-level conferences and prime networking opportunities attract the international maritime industry to Oslo every other year. Richmond B.C. – Corvus Energy is pleased to announce its participation in the 50th annual 2015 NorShipping Conference, Oslo. Corvus will join maritime professionals from over 80 countries in discussions to gain insights on innovation in new hybrid and electric propulsion systems, sustainable ship design, vessel efficiency and industry growth drivers. Corvus Energy will be represented by Andrew Morden, President and CEO, Halvard Hauso, EVP Sales and Marketing, Sean Puchalski, VP Strategic Marketing and Accounts and Geoff Crocker, Director of Product Management and Technical Sales. Corvus will be showing its new state of the art air cooled and liquid cooled lithium polymer Energy Storage Systems (ESS). Corvus has deployed over 24MWh of ESS in over 30 large marine propulsion systems providing increased operational efficiency and enhanced safety & redundancy with significant emissions reductions. Corvus energy is honoured to participate at Nor-Shipping with Green Marine Capital (GMC). Please visit Corvus Energy at the GMC Nor-Shipping pavilion, booth # A1-27. About Corvus Energy Corvus Energy provides high power energy storage in the form of modular lithium-ion battery systems. Its purpose built, field proven battery packs provide sustained power to hybrid and fully electric heavy industrial equipment including large marine propulsion systems.